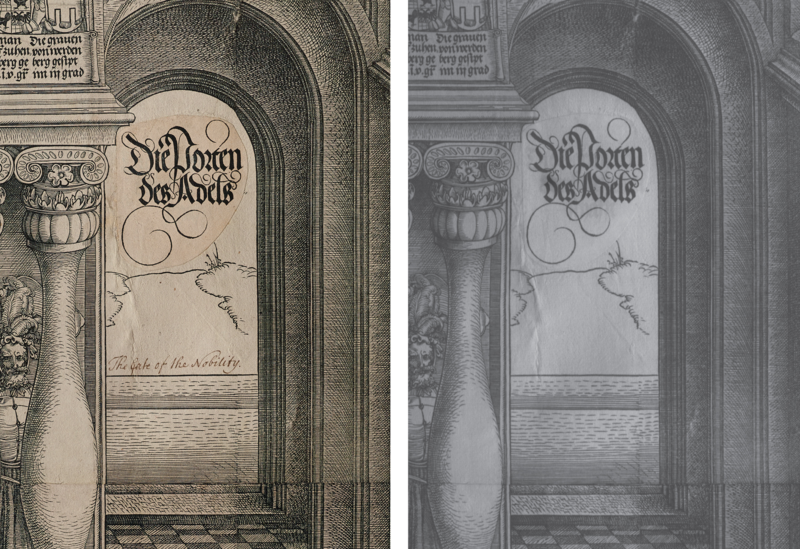 The project to conserve Dürer’s Triumphal Arch reaches the next stage. Ivor Kerslake and Joanna Russel lset out to take a series of high-resolution images as well as infrared and ultraviolet imaging to reveal information about the work, vital for the next stage in the conservation process. Left: A visible image of a detail from the Arch. Right: An infrared reflectogram of the same detail. The words ‘The Gate of the Nobility’ do not appear in the infrared image. Before any conservation treatment could commence, and with the Arch now out from behind its screen of glass for the first time in a generation, we were granted the opportunity to create a series of high-resolution images. The British Museum’s newly commissioned photographic studio was cleared for two days and Dürer’s masterpiece was expertly transported down the six flights of stairs and carefully unrolled in the main studio. Because of the fragility of the print we were unable to position the work vertically, which would have made our work considerably easier, so it was delicately unrolled on the floor. The challenge was then how to get high enough over the print to get it all within one shot. This was the first real test of the new facility. We decided to use a mobile extendable work platform (MEWP). Since the studio had been designed to enable access to and photography of large objects, we had sufficient space to manoeuvre. Carefully unrolling the print ready for photography, with the mobile extendable work platform in place. Senior photographers, Kevin Lovelock and Saul Peckham used their skills to light the print to give an even and colour-balanced appearance, and also employed a raking light technique to highlight areas of special interest to both conservators and curators. The print verso (back) in raking light. While the print was in the photographic studio, scientists Joanna Russell, Joanne Dyer and Antony Simpson took the opportunity to capture some detail shots using infrared and ultraviolet imaging. Joanna Russell setting up the ultraviolet and infrared photography apparatus. Detail of cotton backing with embossed reversed ‘1515’, the date in which the printing of the Arch commenced. Visible light is only a tiny part of the electromagnetic spectrum – beyond the red end of the visible spectrum is infrared radiation, and beyond the violet end is ultraviolet light. This non-visible radiation can also be recorded in images, by using special lights, cameras and filters. These imaging techniques may tell us more about the materials or construction of an object or artwork, depending on the ways the materials interact with the different wavelengths of light. The ink used for the print absorbs infrared radiation, so appears clearly in these images, and is likely to be a carbon-based ink. However, an ink inscription becomes invisible in the infrared image, showing it is made using a different type of ink, probably iron gall ink. Ultraviolet light causes some materials to luminesce, that is to give off visible light. The ultraviolet-induced luminescence from the paper has a yellower appearance in one area of the detail shown below. This reveals that the scene in the bottom left of this detail is printed on a separate piece of paper to the surrounding areas. Image showing an ultraviolet-induced luminescence detail. The scene in the lower left is printed on a paper with a more yellow luminescence than the surrounding areas. The information revealed from these images can tell us more about how the Triumphal Arch was made, and can help to further inform the process of conserving the print.